Regardless of its name, Green Poison Auto by Sweet Seeds is a fabulous treat that will make your bum hum. This autoflowering feminized strain is a result of multiple crossing between Big Devil #2 and the great Green Poison which is well-recognized due to its wonderful sweet and fruity flavor. This strong taste and smell with a soft hint of Skunk has been inherited by Green Poison Auto, additionally lengthening the effects’ duration. Be ready for a pleasant, yet heavy, strike which will last for a long time. 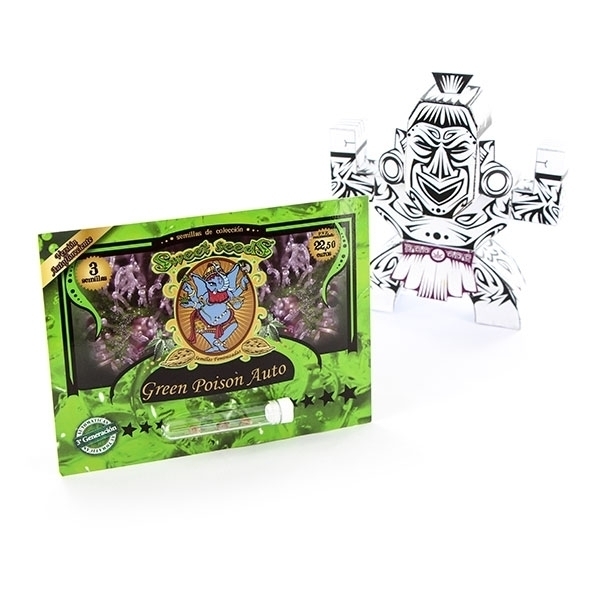 Green Poison Auto by Sweet Seeds is fairly easy to grow, so it will suitable for both amateurs and those who have more experience. This lady grows fast but not very tall (from 60 up to 100 cm) and produces an impressive amount of adorable frosty nugs. She needs only 8 weeks to be ready for harvest and the yield is quite palatial as you may expect from 400 to 550 g/m² of good quality and powerful marijuana. This is a great progeny compared to the amount of time and effort you invest in this plant.